Livewell pumps in 500 GPH and 750 GPH capacities. Johnson & Mayfair are interchangable. two different intake configurations of straight and 90°. Smaller profiles to fit in more confined spaces. Easy to change motor cartridge. 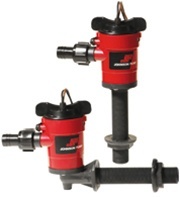 Johnson Pump cartridge aerator pumps offer the ease of convenience and years of realiable service.